Property 76: Sunny Spacious Condo in town centre, Close To Transport, Fun And Tourism. 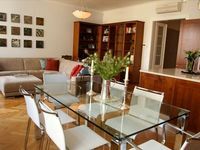 Property 89: Spacious King Wenceslas Studio apartment in Nove Mesto with WiFi & lift. Property 95: High End Designer Luxury in the Heart of Old Town. Spacious, quiet, perfect! Nice Apt in center Prague-PARKING (extra pay). Property 98: Nice Apt in center Prague-PARKING (extra pay).